From the Wonder Woman collection by Eaglemoss Publications. 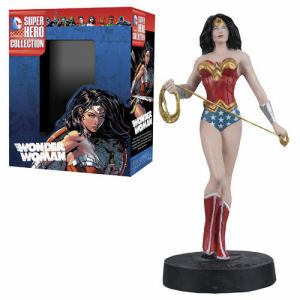 DC Superhero Wonder Woman Best Of Figure with Collector Magazine. From the Wonder Woman collection by Eaglemoss Publications. DC Superhero Wonder Woman Best Of Figure with Collector Magazine. Number 3 in the series. Measuring 3.75 inches tall and cast in metallic resin and hand painted. Each figure comes complete with an in-depth 16-page magazine providing detail on the character and events that occurred to them. Eaglemoss Publications Wonder Woman Figurines shipping from Canada. No Surprise Border fees or Customs!